The greatest star of Warner Bros. cartoons was never seen on camera. 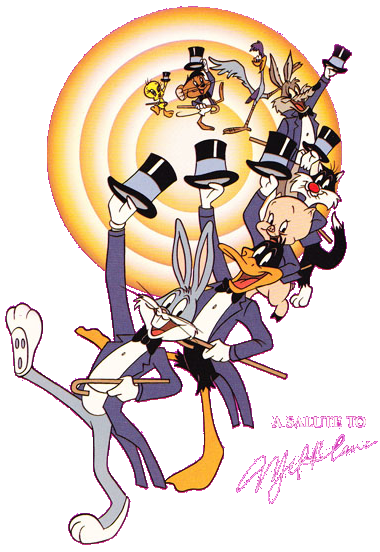 Talk about unsung heroes: Mel Blanc’s voice has brought life to Bugs Bunny, Daffy Duck, Porky Pig, Pepe Le Pew, Yosemite Sam, Tweety and Sylvester, and countless others for nearly half a century. It’s all the more remarkable when you realize that the dialogue for these cartoons is recorded before the animators go to work...which means that Blanc must imagine the action from a series of sketches and create his comic performances on the spot. What imagination and what energy go into such a feat! Mel has met every challenge hurled into his path by writers and directors—and he never seems to run out of voices. (In fact, Daffy Duck and Sylvester were the same voice at one time but Daffy Duck’s was played back faster in the recording process.) Two highlights in this program are the uncontrollable laughter of Porky Pig in Robin Hood Daffy and the unforgettable aria sung by Bugs Bunny in The Rabbit of Seville. Many performers are labeled “unique” in show business but Blanc truly fits the bill: he’s one-of-a-kind and cartoon fans everywhere salute him.